From the moment I learned of Malala Yousafzai, she captured my heart. Two short years ago, this young woman was targeted by the Taliban in Pakistan for her activism in support of accessible education for females. She went to great lengths to ensure she, and her female classmates, were granted the right to their education. And that was all before her life changed drastically on that fateful day when the Taliban tried to silence her through unthinkable violence. Yet, she lives to tell about it. Not only does she live to tell about it; she writes about it, campaigns about it, continues to fight for it. So, it is no wonder that just yesterday, Malala was granted the honor of a shared Nobel Peace Prize for her unshakable efforts, astounding heroism, and courageous bravery. There are two versions of her story! In the more complex version (right) aside from learning the intricacies of Malala’s extraordinary life, it chronicles the inner workings of Pakistan, its politics, its back story, and so much more. It vividly weaves us through the timeline of events taking place in a country that Malala (til this day) calls home. We visit her classroom, accompany her while doing chores at home, meet her family, join her while eating the foods of the land, watch fearfully as the Taliban circles the streets…This is the piece I read. Students willing to take on a piece sprinkled with higher level vocabulary and concepts, also enjoy it thoroughly. And in exposing students to Malala and her cause, we visit her on Facebook at: MalalaFund, on Twitter at @Malala, and on the internet at http://www.malala.org. 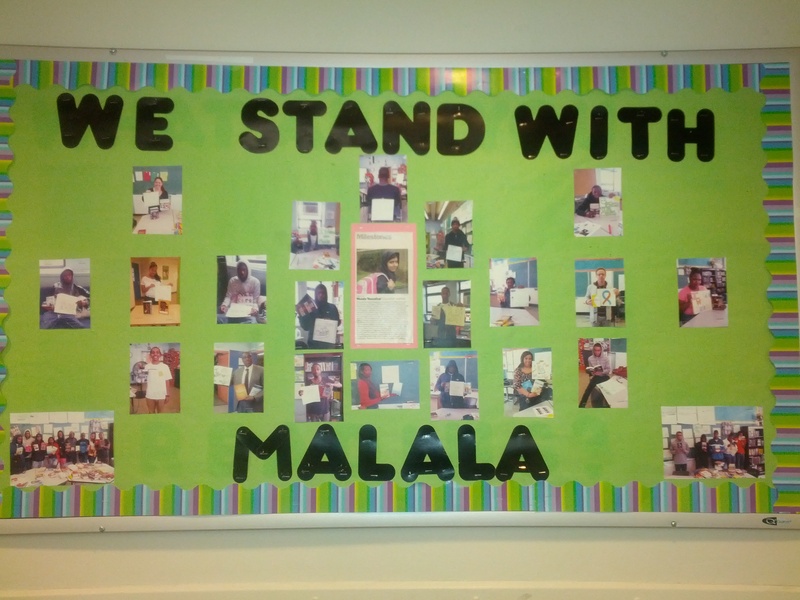 We also support the “I Stand with Malala” initiative by sharing our love for literature with the world! So, when Patricia McCormick decided to pair up with Malala to create a YA version of her story, I (and students) could not have been more thrilled. This piece (left) is written in a more linear fashion. While it would be remiss to alleviate all of Pakistan’s intricacies, it focuses more on Malala and her journey. It is a narrative that provides students an opportunity to learn about this incredible young woman, be motivated by her desire to push agendas in the most positive of ways, and gently guides them through an understanding of what life is like for those fighting for their basic right to education. This piece pairs beautifully with students who have a thirst for knowledge yet are still diligently building their literacy skills. 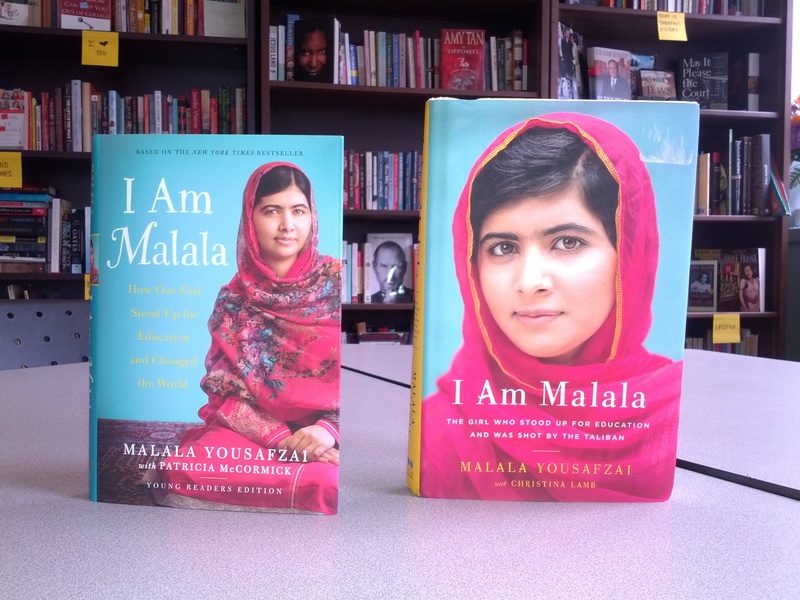 And so I recommend Malala finds her way (in both forms) into each one of our classrooms. Let her spark a fire within our students. Let her show us the way to having the world hear our voices. Let her age be only a number. As Malala so eloquently states at the end of the Prologue: Who is Malala? I am Malala and this is my story. And, what a story it is. Kristina, I am so glad you and your students are inspired by Malala…and her story. I, too, love when students beat me to the punch…it keeps me on my toes. But, most importantly, it shows me ‘they’re in’…I love, love, love that! I teach 11th gradeELA and we just finished reading the prologue from I am Malala. Tons of my students came in yesterday telling me they saw Malala on TV!! They knew this fantastic news before I did and I couldn’t be more proud!! Her voice is reaching so far and wide.